We may forget the natural food cycle in our land of supermarket-sourced plenty, but around the world seasonal food availability makes an impact on maternal diets and those changes appear to leave a lifelong imprint on a child’s DNA. Researchers followed mothers in Gambia – who experience a distinct variation in their diet between the rainy season and the dry season – and their offspring to discover how nutrition impacted the messaging within their DNA. During the rainy season, nutrient-dense veggies (but not a lot of calories) are available and calories (but not nutrients) abound in the dry season. 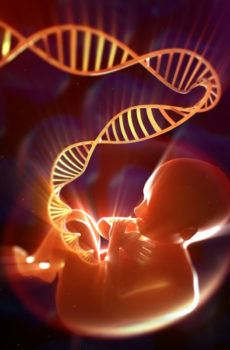 What they found was a distinct difference in the DNA messaging, called DNA methylation, that may alter how the DNA is expressed as a child develops in utero or how their genetics influence disease processes later on in life. This has the potential for far-reaching effects – although the science is too young to fully understand them. So what does this mean for us here in North America? Time will tell; however, we do know that many lifestyle factors from exercise to stress to weight affect our offspring at a genetic level. Our habits before we create life help shape our children’s genetic destiny. If you are hoping to get pregnant, take steps to manage stress and get active. Weight loss can be beneficial prior to conception but restricted calories should never be a part of an expectant mom’s eating plan. Eat whole foods and don’t skimp on any one nutrient such as fat or carbohydrates. And of course, don’t forget to enjoy a colourful assortment of fruits and veggies as a nutrient-dense part of a healthy eating pattern for you and for generations to come. The original research review was published in Nature Communications. Link to actual free access article.